With direct flights, free visa entry, and affordable prices, Filipinos have no reason not to visit Vietnam. 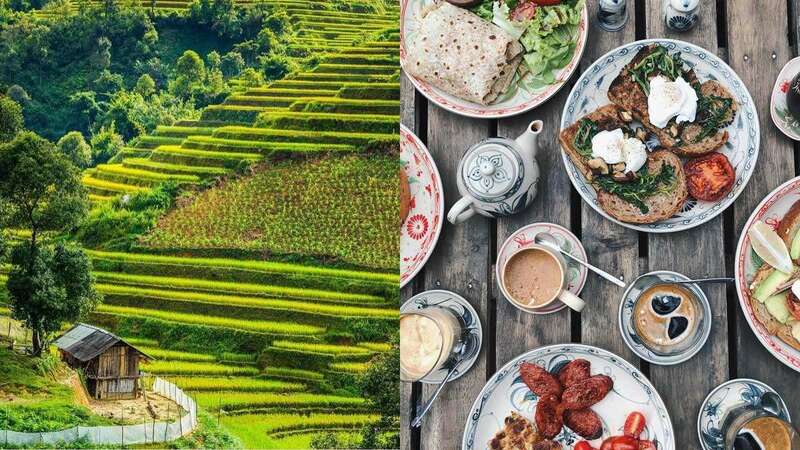 Add to that the country’s intriguing history, stunning natural wonders, and unbelievably delicious food—and you’ve got the makings of the perfect vacation. There are too many awesome things to do in Vietnam, but we’ve curated a list of 18 to help you find memorable activities to participate in, all throughout the country. Long before Anthony Bourdain featured this food stall on his show No Reservation—Nguyen Thi Thanh, aka The Lunch Lady, was already a gastronomical celebrity in Ho Chi Minh City (fun fact: everyone still calls it Saigon). In a culture that values food as much as the Vietnamese do, eating here is a bonafide cultural activity. And for less than P100 per dish, you can’t go wrong. Her food is quick to sell out though, so get there early! Commune with nature in the mountainous Sapa Region of Vietnam. These rice terraces are inhabited by indigenous communities—so you’ll be getting a unique take on the country. There are numerous treks you can join, but we recommend something that gives back to the locals. This Visit.org trek uses its revenue to provide for the education of indigenous students. Off the coast of Southern Vietnam, Con Son Island is a departure from the usual tourist spots in Vietnam. If you want all the pleasure of a tropical getaway, without the noise of the mainland’s party beaches, you’ll love it here. The French colonial architecture against the lush cliffs and serene beaches give off a distinct feeling of stepping back in time. And for those who love scuba diving, this is one of the best spots in the country. Hanoi is a city of beautiful parks, but one of its best is the Botanical Garden. Perfect for a quick photo opp, or for a long day of lounging, the blend of nature, Buddhist details, and sparse crowds make for an ideal oasis in the heart of the capital city. And if you’re looking to be active, there is a public exercise area, a jogging path, and even some adult-sized swing sets! One of the most popular destinations in Vietnam is worth all the hype. This UNESCO World Heritage Site is covered in limestone isles named for its “descending dragon” origin myth. There are many options for exploring this geological wonder—from budget tours to more luxurious options. If you’re feeling adventurous, you can even try it without a guide. But one thing’s for sure—it’s a must-do activity in Northern Vietnam. Another of the most popular destinations is Southern Vietnam’s Cu Chi Tunnels. Just outside of Saigon, this military remnant of the Vietnam War is a great place to get some insight on the history that shaped the country as we know it. You can descend into the tight tunnels, explore the artillery, and even try the shooting range. It’s easy to book a tour at any of Saigon’s travel agents, but if you’re on a budget, the tunnels are conveniently accessible by public transportation. Buddhism is a major part of Vietnamese culture, so visiting their temples and learning about their beliefs is a great way to get a deeper understanding of the country. In Ninh Binh province, an easy day trip from Hanoi, one of the most stunning sites is Bai Dinh Temple. It boasts the biggest bronze statue of Buddha in the country. But the surrounding landscape is worth the drive on its own. This three-story cafe is often brimming with expats and tourists. The western food, the proficient English of the workers, and the hipster vibe, provide diners with a comfortable place to crack open their laptop, or any of the hundreds of books available, for a few hours. But its star attraction is definitely the Egg Coffee. It doesn’t sound too appetizing, but trust us: order it with your brunch. This dreamy amusement park is perfect for the whole family. It offers visitors a wide selection of attractions, including an aquarium, 4D movies, a cable car over the sea, and tons of rides. For your convenience, they also offer hotel transfers. So, you can focus on just having fun! From outside, the Imperial Citadel looks like it could be just one underwhelming tower. But once inside, it’s actually more like the Versailles of Vietnam: a compound of pristine gardens, sprawling lawns, and regal balconies. First built in 1010, there are museums and a host of other gorgeous towers inside its walls, making it a site you could explore all day. If you’re not the type of person who would ever squat next to a bowl of noodles on the sidewalk, Vietnam will change you. Some of the best food you’ll eat here is made by roadside vendors. You can sign up for a street food tour on various sites. Or, for the most authentic results, ask the locals where to go. They may point towards a sketchy alley, but if you smell broth and hear noodles being slurped, you’re good to go. On the central coast of Vietnam, the city of Hoi An used to be a prominent trading port. And so, it has a mix of centuries-old foreign influences, making it a unique destination for travelers. Try to visit during their lantern festivals, which happen three or four times a year. But year-round, the city is best explored by bicycle or motorbike. This bike tour uses its revenue to help provide medical care for those in need. For a touch of luxury on your vacation, make a sunset dinner reservation at The Deck Saigon. Right on the river, the restaurant is furnished with natural woods and white linens. The orchid accents add a fresh update to a nautical theme. You’ll not only enjoy the fusion menu and excellent cocktails, but the laid-back atmosphere as well. Try their chamomile gin with elderflower lime tonic. Not just another monastery, Truc Lam Temple is nestled in pine-covered mountains, with a glistening view of the nearby lake. Take in a panoramic view on a leisurely gondola lift, walk from pagoda to pagoda while taking in the vibrant flowers, or have a picnic under the trees! You can’t go wrong here. One of Vietnam’s most ancient sites, visiting My Son is like stepping back in time. The temples here date back as far as the 4th century, and yet the the impressive building techniques and detailing are anything but primitive. If you’re in Central Vietnam, this is an easy day trip to make from the city of Da Nang. Many of Saigon’s restaurants have open air seating. And with streets as busy as Manila’s it’s best to find eateries and bars on the roof. Secret Garden Saigon not only has great food and decor, but the crowd is young, chill, and international. It’s a great place to meet new friends! This Saigon gallery represents some of the best contemporary artists in Vietnam. So if you’re done with temples and war museums, but still in the mood for a cultural experience, put this on your itinerary. You’ll love the skillfully executed paintings and installations. And you might even meet some of the resident artists during your visit! Saigon has no shortage of bars. And if you’ve got a discriminating palate, you’ll love the city’s craft brewing scene. For sleek interiors, decent bar chow, and unapologetic beer worship, head over to East West Brewing Co in District 1. The Sour Peach Beer is a must-try!